As the development of energy industry and also the enhancing demand of environment protection, the oily sludge, or oily waste discharged from the energy industry are being restricted to be disposed directly. The regulations and standards are more and more rigid than before. Now all the players in this field are facing a problem: how to treat the oily sludge efficiently and safely? GN Solids Control has provided a solution, which is proved to be suitable in both domestic China and abroad. The complete system is combined of several equipment, which serve different applications, including the functions for heating, pre-mixing, reduce the viscosity, separating out the solid particles, leveling the oil and water and finally separate out all of the 3 phases. GNOWS series Oil Water Separator is one of the important equipment in an oily sludge separation system. 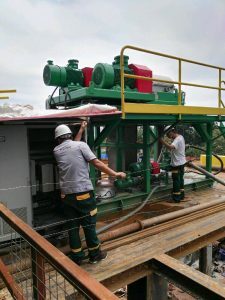 It is located after the GNIPC Inclined Plate Clarifier or a GNLW decanter centrifuge to hold and further treat the liquid phase from forehand equipment, to separate the oil from water. The working principle is gravity stratification cause by the different density of water and oil. Inlet of this equipment is the waste liquid, while the outlets are 3: the clean oil outlet, the clean water outlet and the gas release ports. Inside the GNOWS oil water separator, there is a detachable coalesce, when the oily wasted water enters the oil water separator and meets the detachable coalesce, the oil and water could be separated. Then the oil enters the oil chamber while the water enters the water chamber. The tank is designed to hold the liquid for a while for a complete separation of the 2 kinds of liquid. Outside the tank, there is a visible level meter, for the operator to observe the inside condition in time. For this equipment, GN has different models for different treating capacities, please see details in GN website. 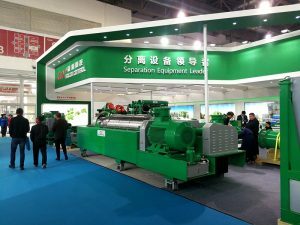 By using an efficient solution of the drilling cuttings waste management system and treat the solids well, the particles could be dryer and even reach the standards to be discharged, meanwhile, the expensive drilling fluids could be collected and put back to the drilling system. 1. 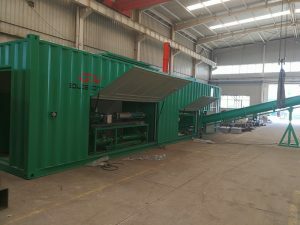 GNCD930 vertical cuttings dryer. 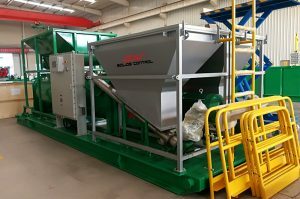 It is like a drying step of a washing machine, by high speed vertical drying, the liquid phase, drilling fluid passes the mesh of the cone sized basket, while the solids phase, the cuttings, fall down to the discharge port. After treatment of GNCD930, the OCC could be less than 5%. And according to different cuttings condition, GN gives 3 optional mesh opening sizes. Clients could prepare all of the three for different conditions. GNCD930 Vertical cuttings dryers are firstly designed for the OBM and SBM, but per some clients’ feedback, it could be useful for some water based mud, too. 2. After the GNCD930 vertical cuttings dryer, the drilling cuttings are collected while the drilling fluid falls into a container and to be pumped to next step, the GNLW363 series decanter centrifuges. GNLW363 series decanter centrifuges are the super star among GN centrifuge models. In every 10 sets of GN Centrifuges, 7 are GNLW363 decanter centrifuges. It has the medium size and more optional control panels for option. In solids control system, clients always choose fixed speed GNLW363, while in drilling cuttings waste management or drilling fluid treatment project, the VFD model with PLC control panels are more popular. In some none explosive conditions, clients could choose the more economic model, while in some countries and regions when IECEX or ATEX is a must, GN also have those models for option. 3. GNSC series screw conveyors. By providing screw conveyors of different diameters and length, GN has 12 models for option. Clients could choose per the transporting capacity and distance to be transported.